MASKerade: OLS2 - Can You Repeat That? OLS2 - Can You Repeat That? This month's One-Layer Simplicity challenge is to use repetition on your card. I just got this Yellow Owl Workshop set of two balloons (only one used here - the other says birthday). It has a childlike feel to it so I used bright basic colours (I see that some of my inkpads need to be reinked!) and then used a sharpie to draw the strings down to the Hero Arts 'birthday'. I chose the Sharpie because it is about the same thickness as the font of the black sentiment. I think that thinner strings would cause the card to look unbalanced. Another design tip - I notice when I'm overlapping inks like this, yellow can very quickly disappear underneath the other darker colours (see where it overlaps with the green? No? Exactly my point! ), so I usually try to minimize the overlap so that it feels like there is an adequate amount of yellow in the design. I'm also linking up to Less Is More 158 - One Layer Anything Goes. So fun...what a fabulous way to say Happy Birthday!!! Love your design tips! This is perfect Ardyth! This is great fun Ardyth! Okay, my Great Mind buddy! Clearly the bold and bright balloon thought was floating around today! 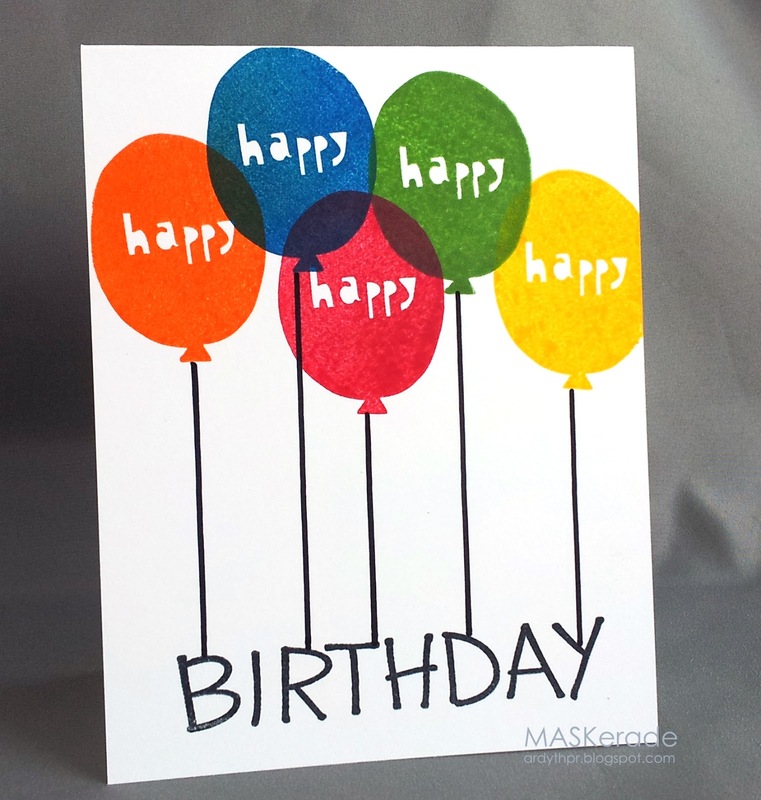 :) I love this balloon stamp! I just went over to the Yellow Owl Workshop. Oh dear me. So much cuteness! I'm glad you're educating us as well as inspiring us. This is a bright and cheerful card that makes me happy, happy, happy. Your card is so cheerful and fun. It's a great birthday card. Wish i could repeat that! This is an awesome card. Thanks for the tip about yellow. I never thought about that, but I see what you mean. Fab card - as usual!